NECKLACE - SARAH COVENTRY. "FAITH" FROM 1966. 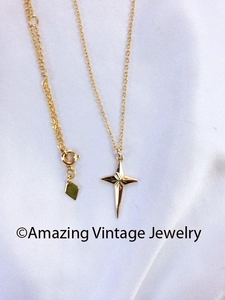 GOLDTONE POINTED CROSS IN A DANISH-MODERN LOOK. PENDANT IS 1" LONG, 5/8" ACROSS. CHAIN IS ADJUSTABLE TO 16" AND 18" LONG. 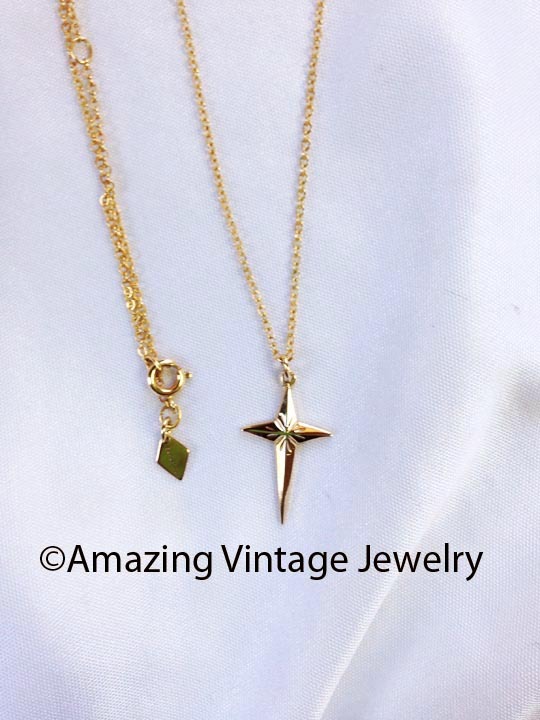 VERY GOOD CONDITION ALTHOUGH THERE ARE SOME DARK SPOTS ON THE CHAIN. ORIGINALLY CAME IN BOTH GOLDTONE AND SILVERTONE - MUCH HARDER TO FIND IN GOLDTONE.